Art has been used for centuries to help people express what they cannot put into words. And across the country, art is increasingly being used to help people with Alzheimer’s disease. The process of making art, and appreciating art, not only may be helpful to anyone with Alzheimer’s disease, but to those who care for them as well. Although studies on art’s effects on the brain are limited, research suggests that artistic engagement may help to ease common behavioral symptoms of dementia like anxiety, agitation and depression. It may also boost mood and self-esteem, and possibly help stimulate memory. 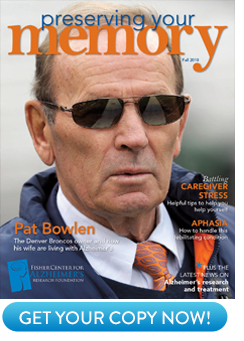 By having a beneficial effect on those with Alzheimer’s, caregivers may find relief as well. One way that art has been used in a health care setting is with art therapy, in which artists, facilitators and mental health professionals use art materials to help people express their feelings through painting, sculpture and other media. There are an estimated 5,500 art therapists nationwide, some of whom specialize in working with people with Alzheimer’s disease. 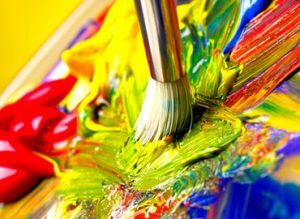 Art therapy typically takes places in small groups at community and senior centers, nursing homes and other care settings. Two small studies found that an art therapy program called Memories in the Making, in which art facilitators offer weekly art making sessions to people with early to moderate dementia, seemed to provide benefits. More than 80 percent of the participants in one study could stay focused during the 30 to 45 minute sessions, with most smiling, laughing and otherwise appearing to enjoy themselves. In a follow-up study of the program involving an hour of art therapy for five weeks, participants showed signs of improved self-esteem compared to a control group that discussed current events or did crafts. Art therapy may produce additional benefits for those with Alzheimer’s as well. In a trial involving 39 people with mild Alzheimer’s in Japan, those who participated in art therapy showed less apathy compared to a control group that did simple math exercises. In another study of 45 people in Britain with mild to moderate dementia, those who engaged in art making once a week for 40 weeks showed improvements in physical abilities, became more social and were calmer compared to a group that did recreational activities. In recent years, museums have gotten into the scene, offering art appreciation classes for people with Alzheimer’s and their caregivers. The Meet Me at MoMA program, at the Museum of Modern Art in New York, was one of the first. The museum offers monthly 90-minute sessions for seven or eight patient-caregiver pairs, in which museum curators lead discussion of four or five artworks from the museum’s collection. The sessions offer opportunities for positive social engagement, self-expression and stimulation. Researchers at New York University Medical School spent nine months observing the sessions. They had participants fill out questionnaires and organized in-depth focus groups with participants. The mood of those with Alzheimer’s improved during the sessions. Caregivers also enjoyed the museum outings, reporting that they felt a greater sense of social connection and less emotional distress afterwards. Seeing a loved one with dementia light up about a painting or piece of sculpture can help them to once again catch a glimpse of the person they once knew more fully. Similar programs are now offered at dozens of museums across the country, including the Frye Art Museum in Seattle, the Carnegie Museum of Art in Pittsburgh and the Walker Art Center in Minneapolis. Art might be a good choice for someone with Alzheimer’s disease for a variety of reasons. For one thing, the ability to make art, and certainly the ability to look at art, is relatively preserved in those with Alzheimer’s disease. Deficits like impaired memory, learning and language are typically not impediments to making art, especially in the early to moderate stages of the illness. The artist Willem de Kooning, for one, continued to paint after his diagnosis of Alzheimer’s, with his painting style becoming looser and more lyrical and his colors bright and primary. Some critics consider this late-life work among his best. Art is also an expression of feelings and emotions, and nonverbal skills are typically less affected in the course of Alzheimer’s disease than verbal skills. Patients with Alzheimer’s have rich internal emotional lives that might find expression in the art making progress. Most patients express a wide range of facial emotions even late in the course of the disease. Through the use of line, form and color, art may provide a way for those with the disease to express their inner emotions and feelings. Doctors and family members caring for a loved one with Alzheimer’s are always looking for things that can be done to improve the lives of someone with dementia. Drugs for Alzheimer’s provide only limited benefit and do nothing to stop the relentless downward progression of disease. Art making and art appreciation may be an easy thing to incorporate into the lives of those with Alzheimer’s, with benefits that may extend beyond the patient to caregivers as well. More about art therapy can be found at the American Art Therapy Association website, at arttherapy.org. Sources: American Art Therapy Association. Bree Chancellor, Angel Duncan Anjan Chatterjee: “Art Therapy for Alzheimer’s Disease and Other Dementia.” Journal of Alzheimer’s Disease, Vol. 39, 2014.